Gartner has published its redefined "2016 Magic Quadrant for Business Intelligence and Analytics Platforms," and we are pleased to share a complimentary copy of this important research with you. 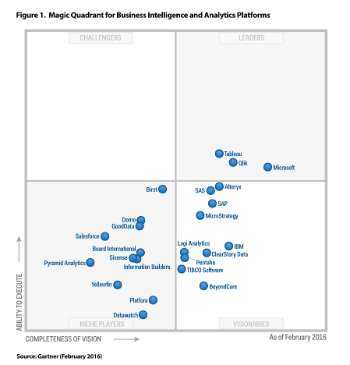 This year’s Magic Quadrant for BI and Analytics Platforms has been redefined to reflect that analytics purchases are now dominated by business users that demand easy-to-use and easy-to-buy products that deliver clear business value and enable powerful analytics. This graphic was published by Gartner, Inc. as part of a larger research document and should be evaluated in the context of the entire document. The Gartner document is available to be downloaded here on this landing page.